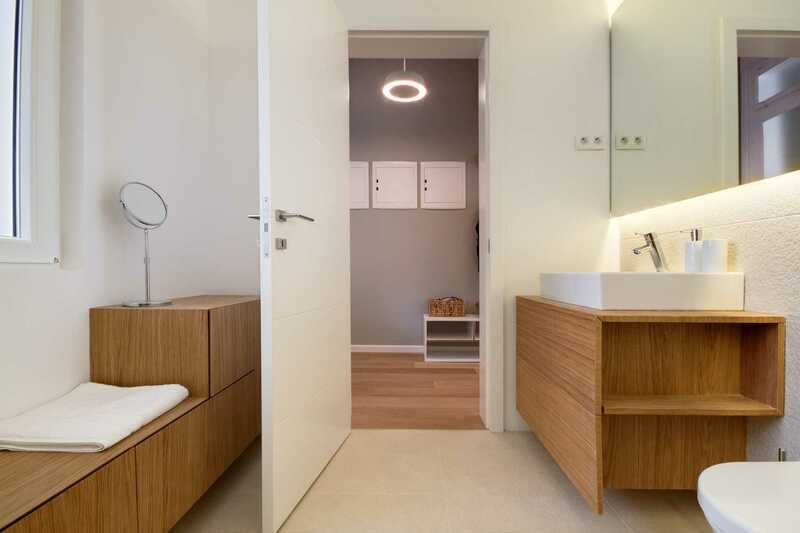 If you want the style and luxurious finishes of a high-end boutique hotel, but the space of a 2-bedroom, 2-bathroom apartment look no further than our redesigned and refurbished Ljubljana apartment on the best, most central location in the Old Town. This is a beautiful apartment in a quiet neighborhood just a few steps from the old town and farmers market. 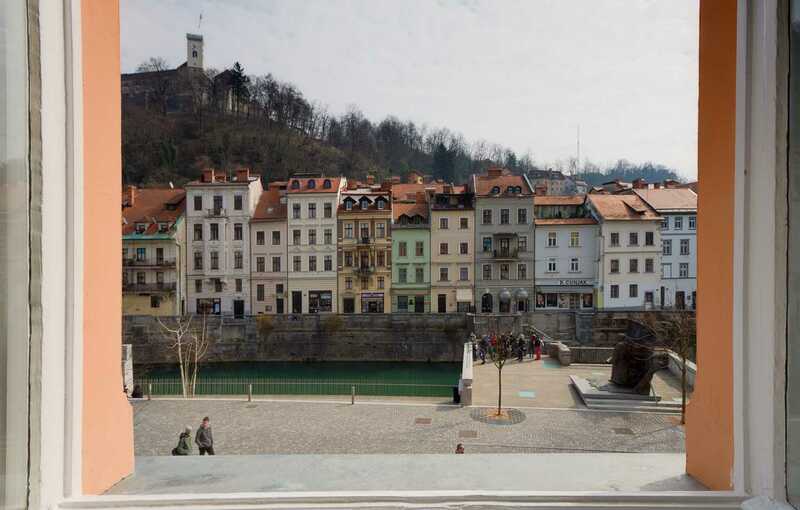 It is a perfect place for enjoying Ljubljana. We had a very pleasant stay. 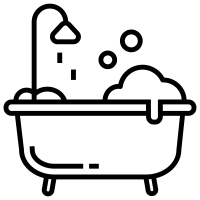 The appartment is located in a quiet area, it’s very nice, clean, well equiped and close to everything, Shop, market, historical center and restaurants. We really enjoyed our stay and recommand it. We had an awesome stay at Fine Ljubljana apartments. Everything was just like on the pictures. The apartment was super clean and very cozy! Communication with the hosts went great and checkin/-out was perfectly on time. I would definitely recommend booking the apartment. Thank you! I can’t recommend this place enough! 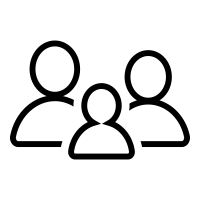 The apartment is well provisioned and comfortable, and very centrally located – just around the corner from the food market and Dragon bridge. Check-in and check-out were smooth and easy to coordinate. We really appreciated the up-to-date Ljubljana city guides and maps and great restaurant recommendations from the host as well. A great place! Great stay! Beautiful flat where you can find anything you possibly need. The communication went also well. Amazing place, lots of attention to detail and cute touches. 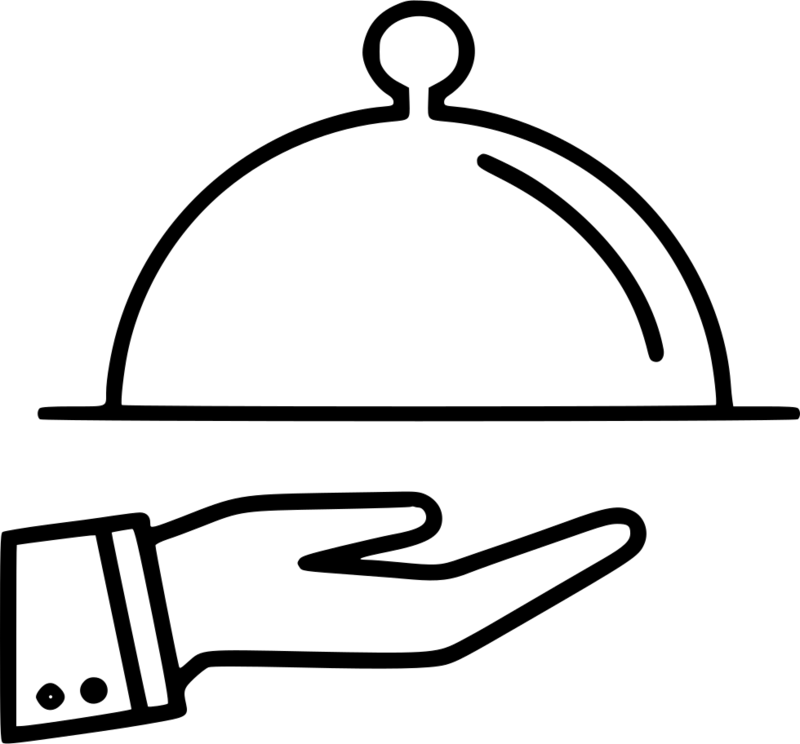 They took the time to settle us in, and gave us some great recommendations for restaurants, very helpful and flexible with timing etc. The apartment was great! Very cozy & also perfect for a family with a little kid. It’s in a quieter part of town but only a 5 min walk and you’re in the centre! I would recommend it to friends! Apartment is really very cozy! We felt two days like we were at home. TWe have spent a great time in Slovenia and Ljubljana is a perfext city to stay. ”Up Art” apartment is the best we have ever been to, really close to the center but in a quiet street, extremelly well-equipped and very nice. We would specially agree the kindness of the owner! Absolutely recommendable. Estupendo. Con todo lo necesario para sentirte como en casa. Muchos detalles de bienvenida: fruta,café, bombones, etc. Me gustó todo. The apartment was wonderful and had everything I needed for my stay in Ljubljana. I can’t recomment it highly enough. Thank you so much for all the effort you put in to ensure our stay was a memorable one! We loved Slovenia and we’ll definitely be back. Very warm welcome, the apartment was very cozy and beautiful, close to the city center (just a 10 minute walk), the greeter and the host were very helpful and friendly. Very close to the old town but quiet apartment. Comfortable and homely too. Perfect for short trip away. Nous avons passé un excellent séjour, rien ne manque la propriétaire est aux petits soins avec ses hôtes, de l accueil avec une corbeille de fruit, champagne et apero il ne manque absolument rien du petit déjeuner (café,thé et corneflex etc) elle pense à tout pour les séjours de 4 jours (huile,vinaigre, sel,poivre etc) vous avez même les parapluies ce qui n est pas le cas dans tout les pays de trouver autant de choses même la lessive et les produits pour se laver n emmener rien vous trouverez tout. Une propriétaire hors pair allez y les yeux fermés vous ne serez absolument pas déçu. My mother and I spent 4 nights here and absolutely loved everything about the apartment : it’s beautiful, comfy, spacious, above average appliances/equipment, and very well located. can not recommend it enough!!! really one of my best airbnb experiences so far! Great hosts, very welcoming. Great central safe and quiet location. Spotlessly clean. Well decorated. Included all essentials. Do reccomend and will be back again! Bonito apartamento en el centro de la ciudad. La dueña es muy amable y siempre dispuesta a ayudar. This spacious apartment is stunning in many ways – it really is a cut above the rest with its high-end lighting and custom made furnishings, top quality appliances and bathrooms, a bright and welcoming interior, and some of the most magical views you are likely to get from any apartment in Ljubljana. This magnificent view of Ljubljana Castle, Old Town historic architecture and the River Ljubljanica is what you can wake up to each morning. 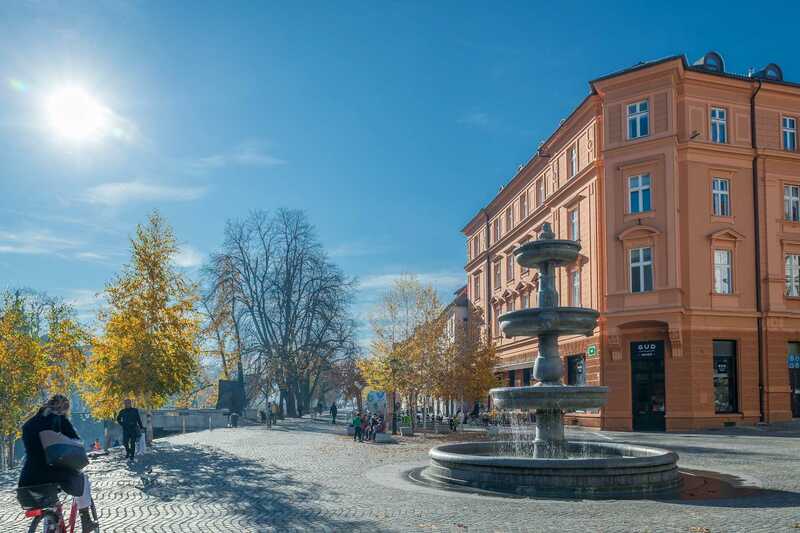 Located right on the historic New Square in the heart of the Old Town’s pedestrian zone (no cars, no traffic), you can sit in your apartment and enjoy the wonderful views over the square, Castle Hill, Cobblers’ Bridge and the River Ljubljanica. The main living area combines living room, dining room and kitchen and is welcoming and bright. The window nook straight ahead is the perfect place to read or enjoy the views over the square. 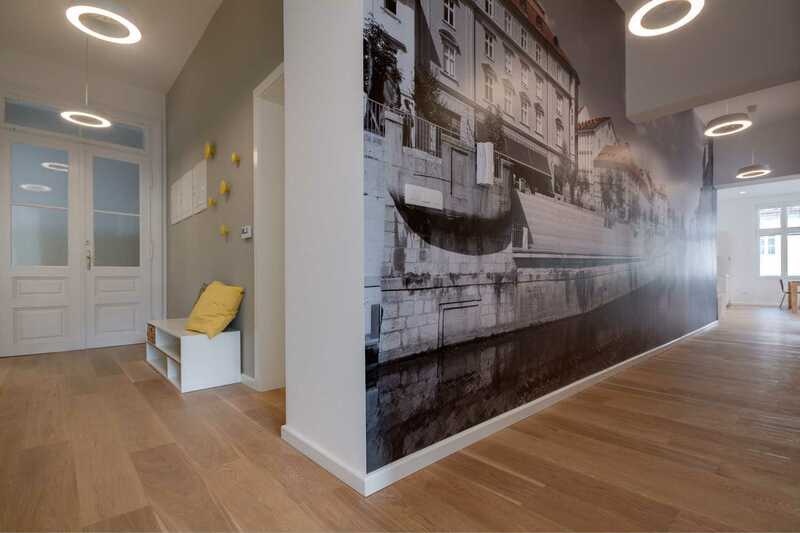 It’s difficult to quickly highlight the features of this Ljubljana apartment rental because there are so many wonderful things about it. The fact that up to 6 guests can be accommodated, plus 2 on a sofa bed, is a huge plus. 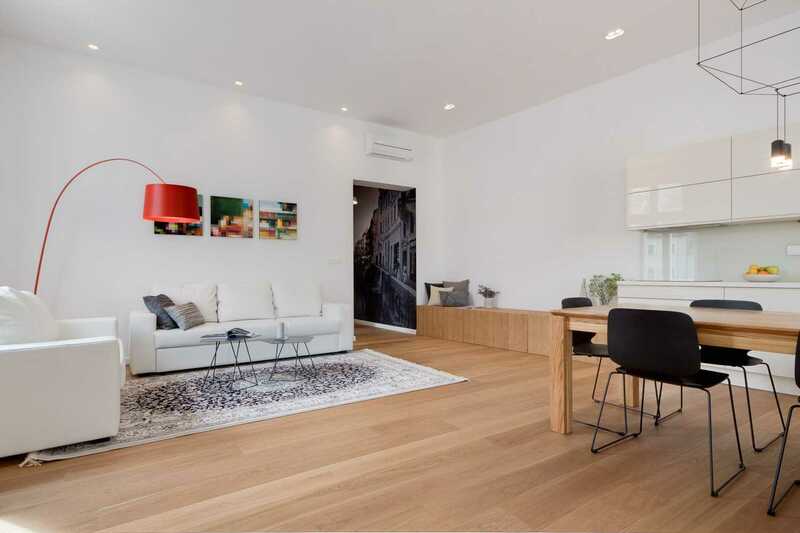 There are two bedrooms and two bathrooms as well as a separate powder room, while the open plan living area has the living room, dining room and kitchen and is the social heart of this apartment. Leather sofas, Persian rug, designer lamp and custom hardwood bench are just a few of the luxurious touches in this apartment. As already mentioned, the location is second to none – perfect for leisure tourists who want to be in the center of the Old Town, but, this pedestrian-only zone has no vehicles so there’s little traffic noise and ample fresh air. 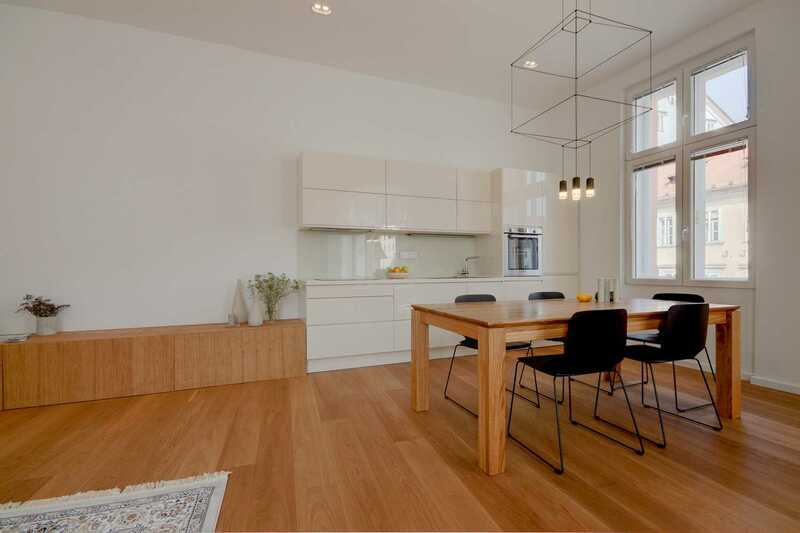 The apartment receives the morning sun through its large windows along with plenty of light throughout the day, so during the summer months it’s lovely to be able to open the windows wide and let the atmosphere of the New Square flood in. Living room windows open wide to the lovely square with a fountain. Undoubtedly the best views you can have from any Ljubljana accommodation. 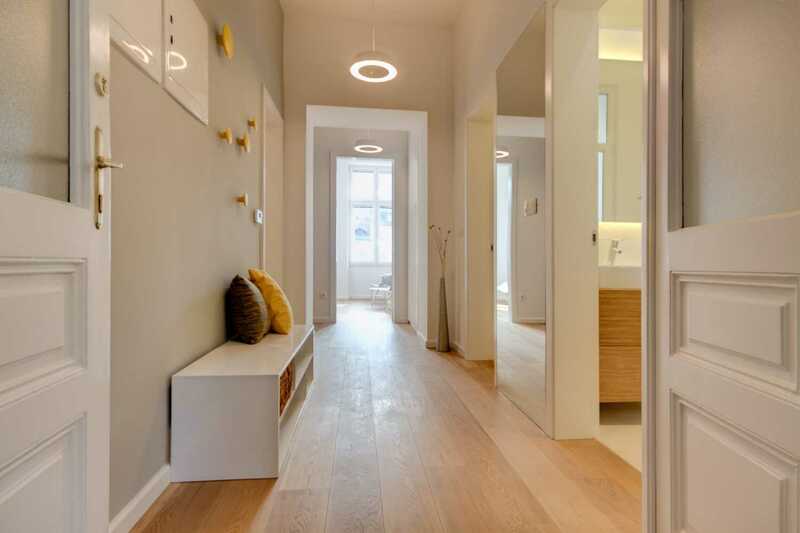 Our Ljubljana apartment on New Square is the latest Fine Ljubljana Apartment to benefit from a complete redesign and refurbishment. Alenka, our resident architect and designer, has given this 2-bedroom apartment the VIP treatment with no corner left untouched. 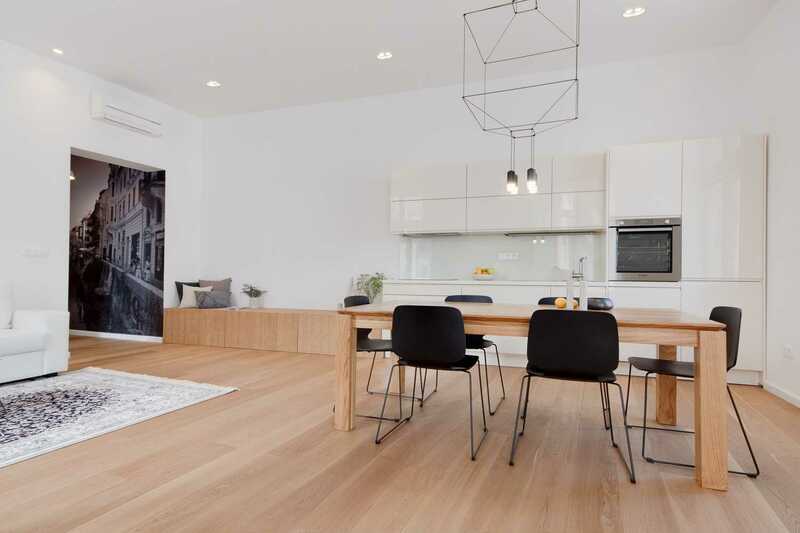 Beautiful hardwood flooring has been added throughout the apartment, except in the bathrooms, and all floors benefit from underfloor heating to keep you warm if you’re staying during the cooler months of the year. In the summer it’s always nice to open the windows and on really hot days there are three air conditioning units to keep the place cool. 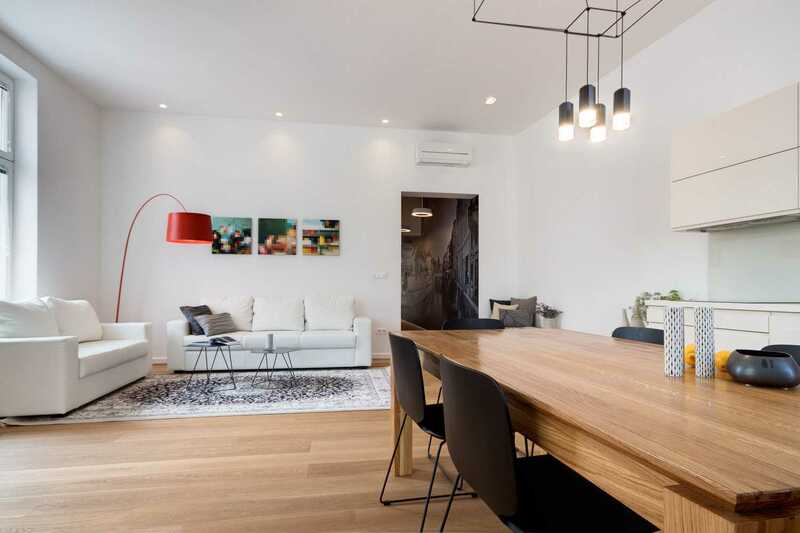 You won’t find any standard rental furniture in this Ljubljana apartment – all furnishings are high end and many pieces were custom-made especially for this space. Oftentimes lighting comes as an afterthought, but not here. 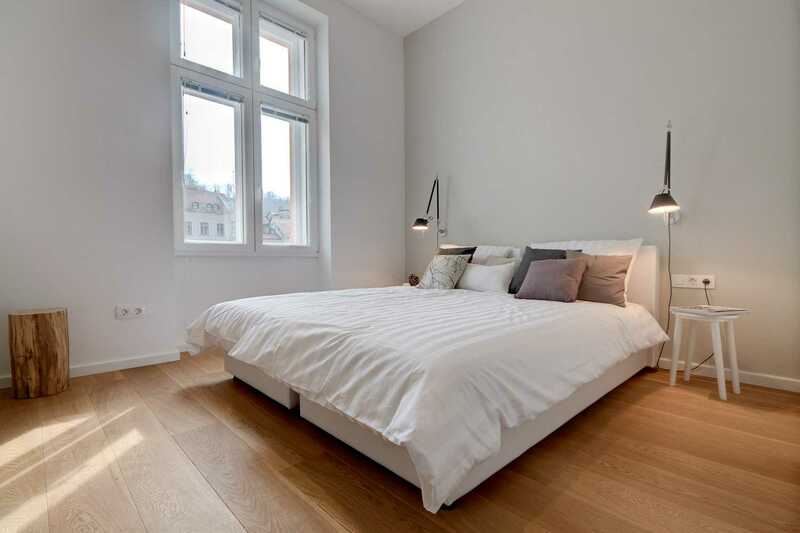 Special attention was given to the lighting in each room so that all areas are well lit with modern, high-end fixtures. The open plan living area is a great place for socializing. 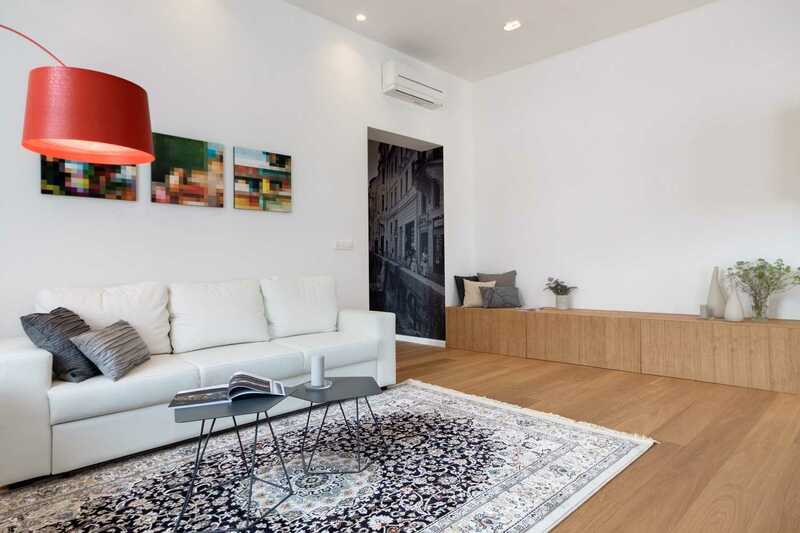 We’ve already mentioned the excellent location several times, but it really is worth highlighting again especially for anyone considering this splendid apartment for a short break in Ljubljana. 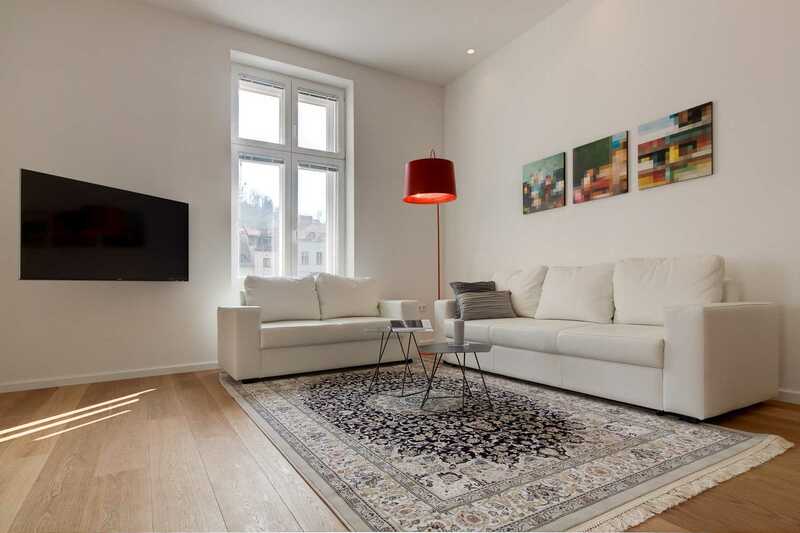 Set right on Novi trg, which in English means New Square, the apartment is in the heart of Ljubljana’s Old Town. 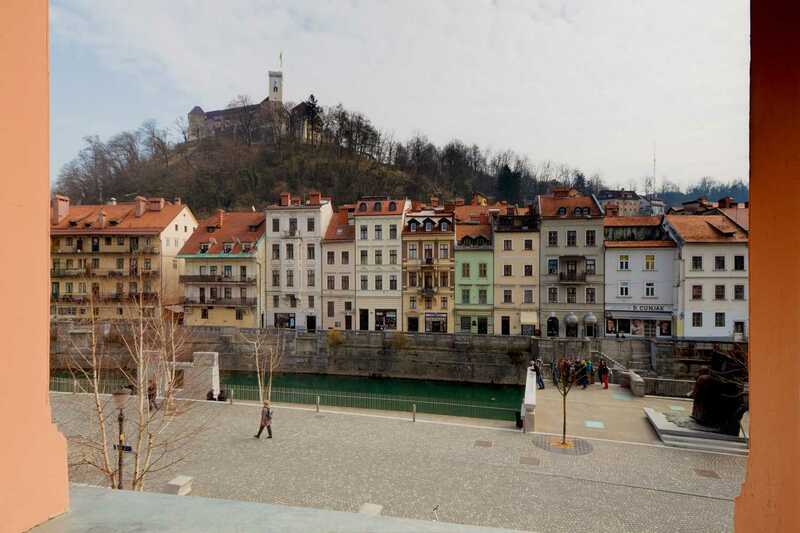 While it may be called “New Square” it is far from new – the square actually has its origins in the 12th century when it was considered to be a separate urban area to Ljubljana and did not officially become part of the city until the 14th century. 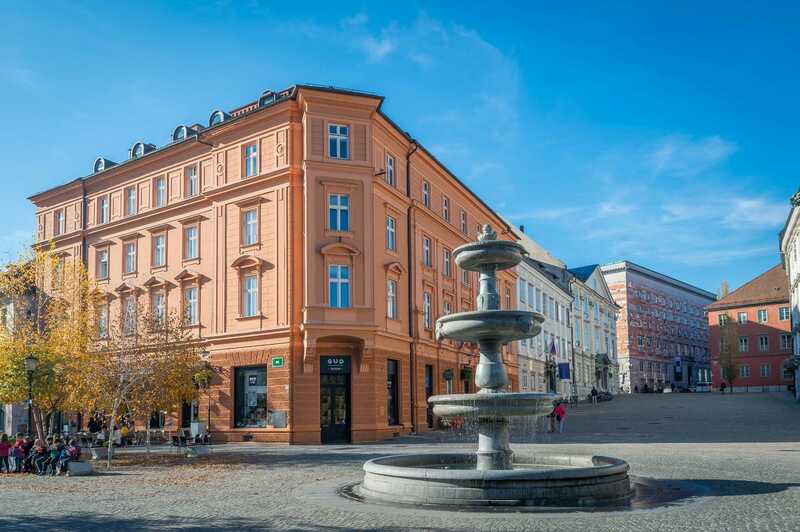 The apartment is located on the first floor of the beautifuly renovated light orange colored historical building on the left. The square benefited from an overhaul in 2013 and today it’s a hive of activity particularly during the summer months when the cafés and restaurants spill out into the square. Sit and enjoy a drink or a meal, al fresco, listen to the flowing water in the square’s historic fountain or the sound of live music that often fills the square. The square and river embankment host the only flea market in the city, every Sunday from the beginning of March until the last week in November. Over the Christmas period you can visit the popular Christmas Market that happens in the street right next to this apartment building. The apartment is set within a historic building and although it has been thoroughly modernized there are still some nice traditional features to see. The first is the original double doors that you come through to enter the apartment. This style of doors were once used all over the Old City and these particular ones were well preserved but have been renovated to match the bright and clean interior of the apartment. The first of the custom-made pieces of furniture can be seen as soon as you enter: the sitting bench was custom designed to double as shoe storage, and above this the yellow coat hooks provide a sunny and warm welcome. 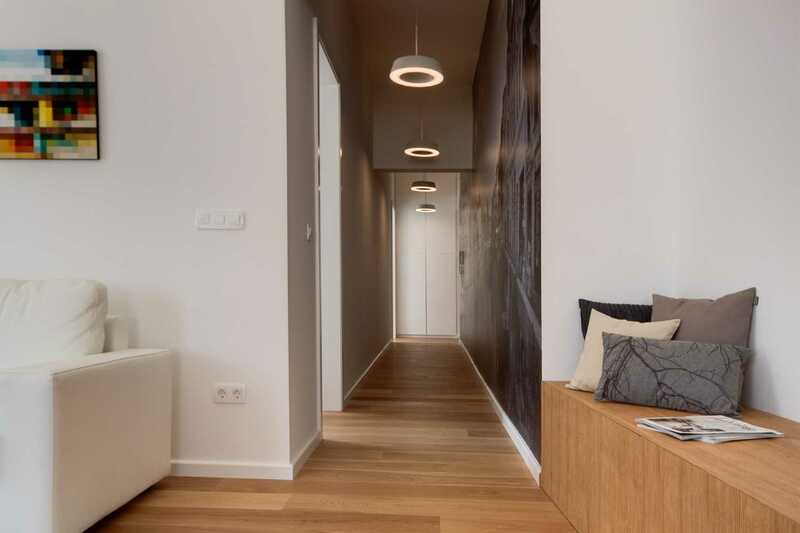 Above, the low dropped Nordlux Orbit 36 lights provide ample light for the entrance hallway. Doors from the hallway lead to both bathrooms, the master bedroom and the powder room and off this entrance hall you access the main hallway that takes you through to the living area. The entrance hall leads to the main hallway with fabulous New Square wallpaper. Look closely and you’ll find this apartment! The wallpapered wall in the main hallway is more than just a modern feature, it is actually a photo of the New Square location with the fountain, the embankment and the famous and popular Cobbler’ bridge. While the picture is black and white the roofs of the buildings are shown in their traditional orange clay color and the whole scene draws you further into the apartment. 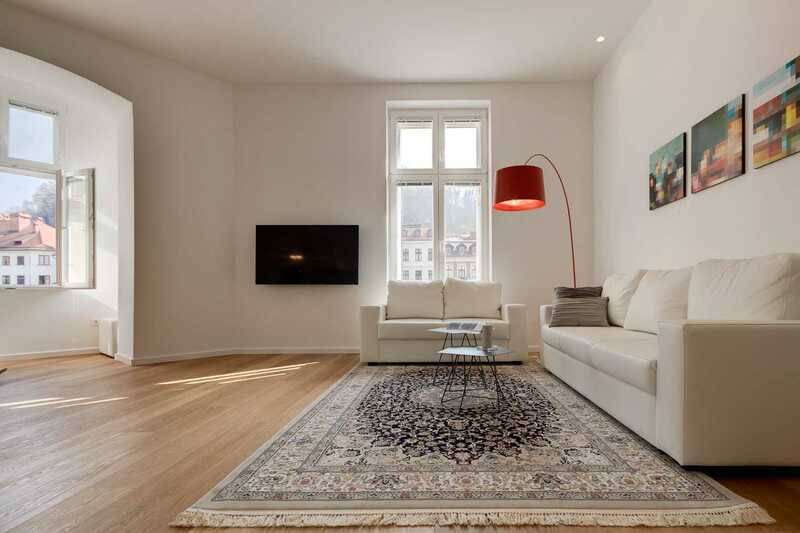 The Persian rug brings warmth to the living area, as does the underfloor heating. The open plan living area is spacious and bright. White leather sofas provide plenty of seating, and one of them converts into a sofa bed for extra sleeping space. 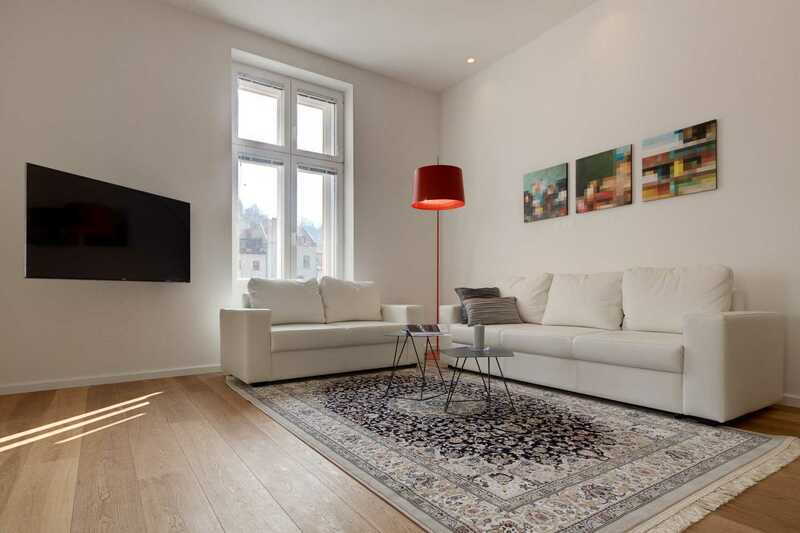 The large Smart TV has internet access – the entire apartment has a very good WiFi connection – and the TV can be moved so that it can be seen from the kitchen or the sofas. The window nook is the perfect place to read a book or have a glass of wine in a good company. Splashes of color continue into the living area where red is the theme. 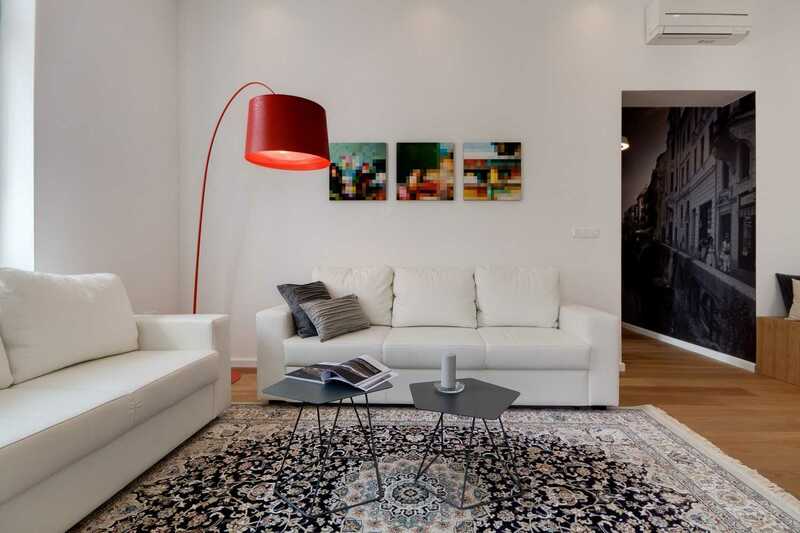 Pick out the reds on the antique Persian rug and the pictures on the wall, while the Twiggy light in the corner and the tea table in the reading nook are a more obvious, vibrant red. 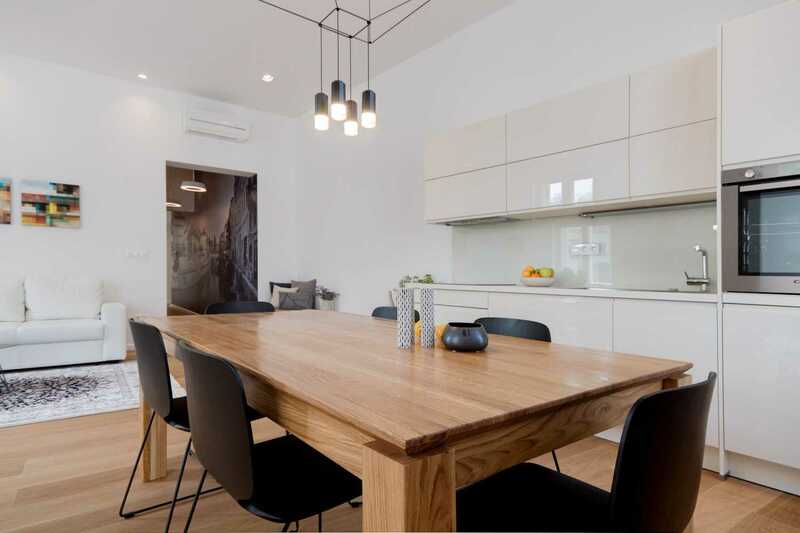 In the dining area is a custom-made hardwood dining table that is illuminated by a special light fixture called Wireflow by Vibia, plus the chairs and side tables in the living area are all designer pieces including the comfy rocking chair that sits in the window nook. This nook is the perfect spot for reading, sipping your morning coffee or just to watch the world go by. 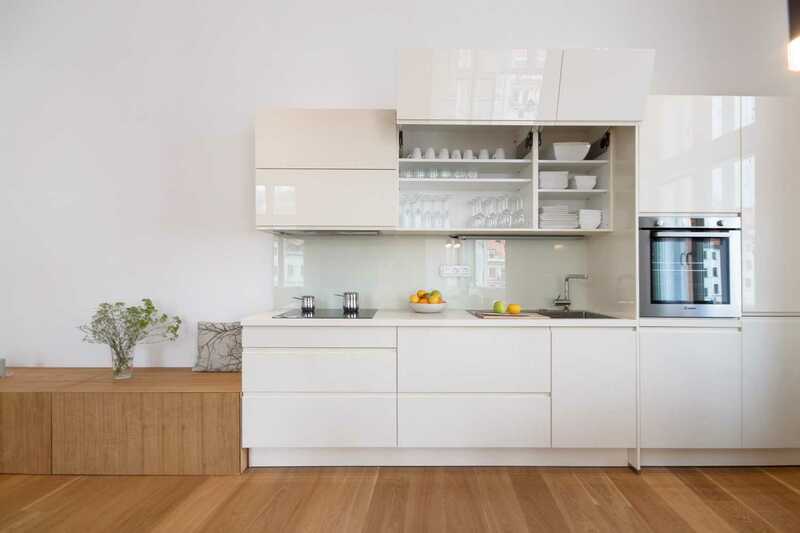 The kitchen is sleek and modern with a glossy backsplash and units, built-in oven, and glass-top hob. 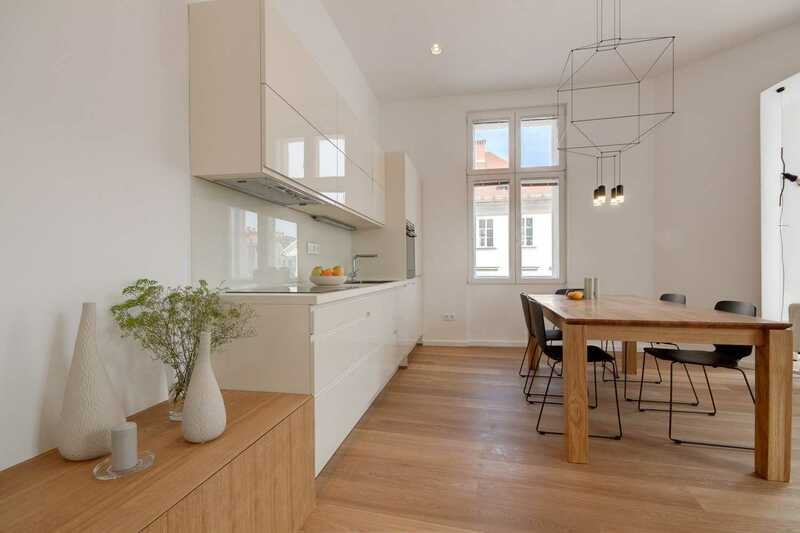 If you think the kitchen was purposely designed for this space, you’d be right – it’s just one more of the custom-made features of this Ljubljana apartment. All the appliances including dishwasher and microwave, and all the crockery and utensils you could possibly need have been provided. The hardwood sitting bench that runs along the wall from the kitchen to the main hallway is yet another custom-made piece of furniture. It provides extra seating space and a place to put things. 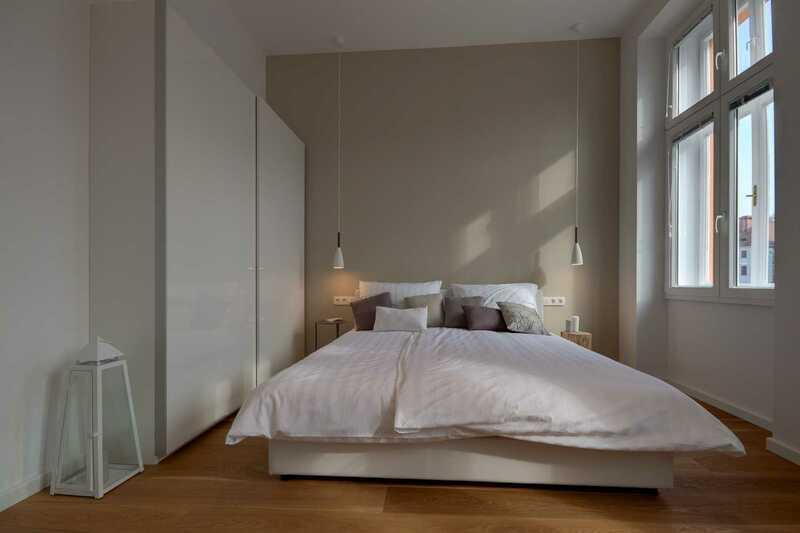 Both bedrooms are spacious and light and have ample storage space thanks to their large closets with sliding doors. 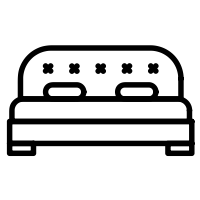 Designer and custom-made pieces of furniture can also be found in both bedrooms, such as the two designer lounge chairs in the master bedroom and the wooden, custom-made night stands in the second bedroom. Up to 4 guests can sleep in the second bedroom as there is a convertible sofa that converts into a bunk bed that would be perfect for a couple with children. 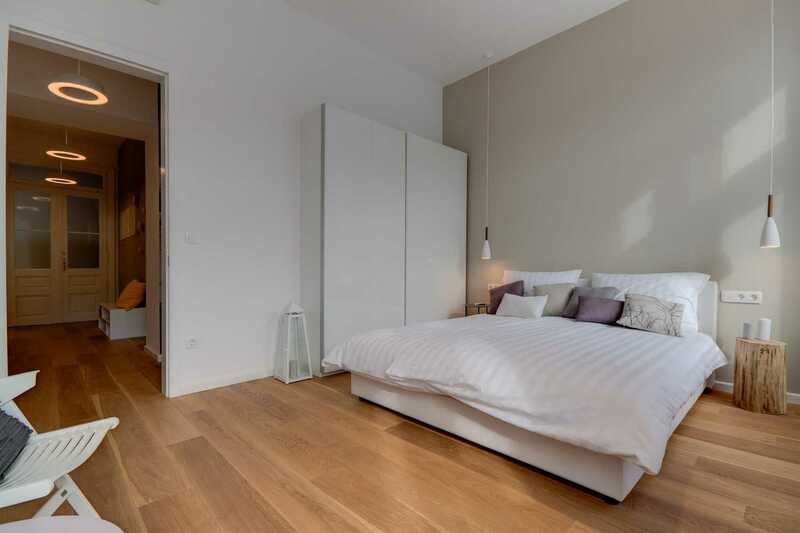 This bedroom is quite adaptable for guests as there is the option to have two twin beds or have them put together as a double – as can be seen in the photos. 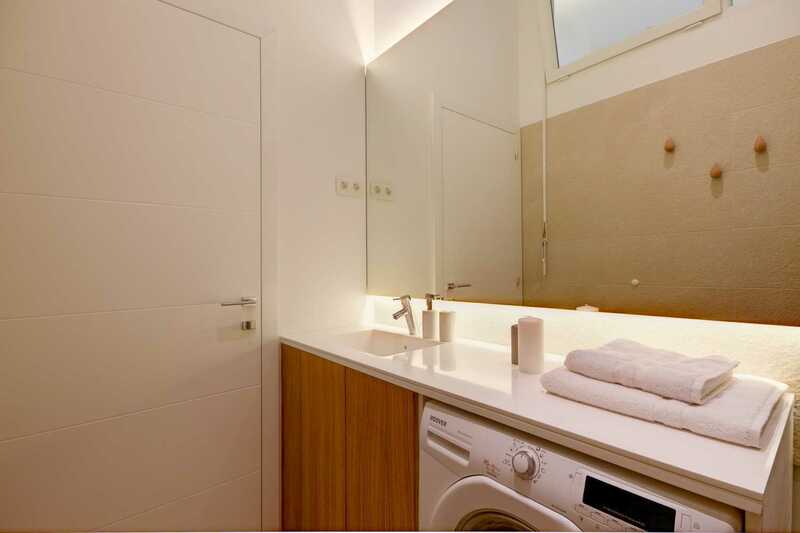 Perhaps the best place in our Ljubljana apartment to get the feel of a luxurious boutique hotel is in the bathrooms. 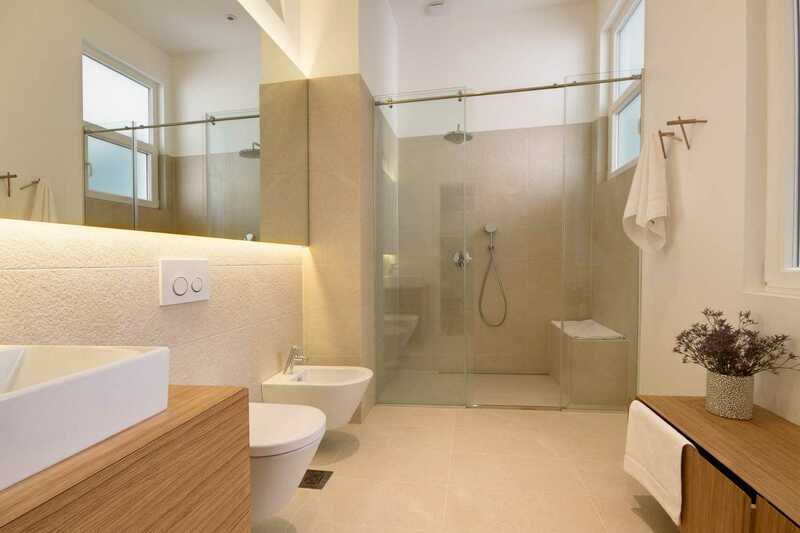 There are two modern bathrooms with high-end fixtures including a custom-made walk-in shower in the larger of the two bathrooms. It features a sitting bench and a rain shower. 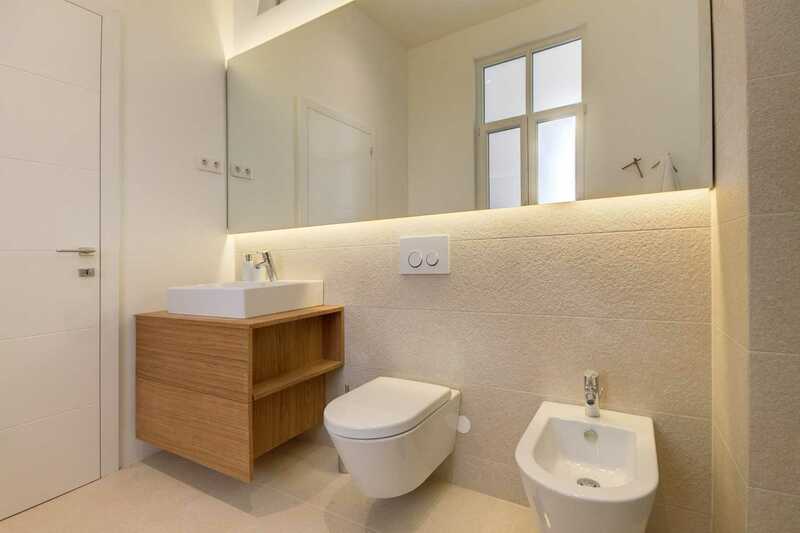 This bathroom also has a wall hung toilet and bidet plus a cabinet with plenty of storage space for your toiletry items. 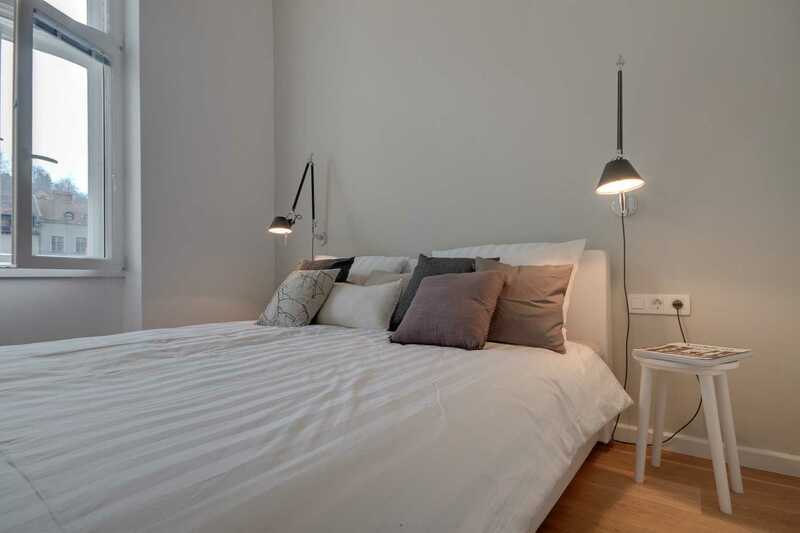 The oak towel hangers on the wall are made by Norman Copenhagen. The second bathroom also has the same towel hangers and there is a glass enclosed shower in this room as well as the apartment’s washer/dryer machine. 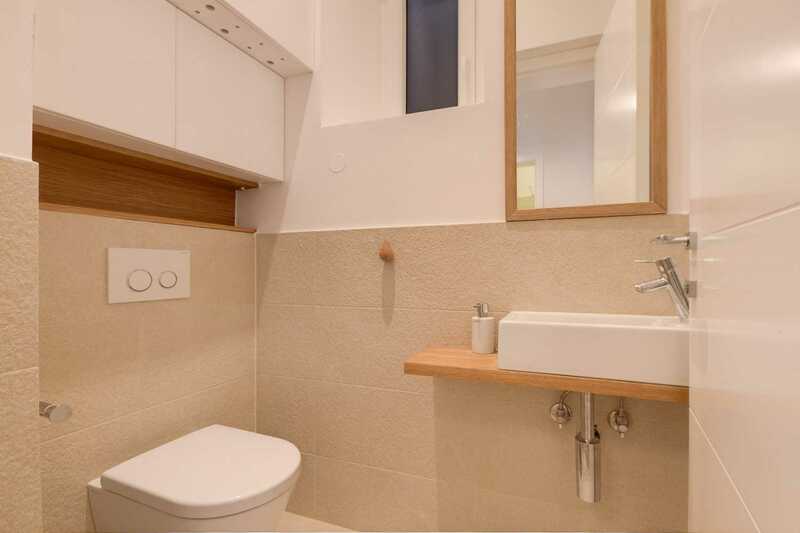 There is no toilet in the second bathroom but there is a second toilet in a separate powder room which is very practical when the apartment is being used by larger families or groups. 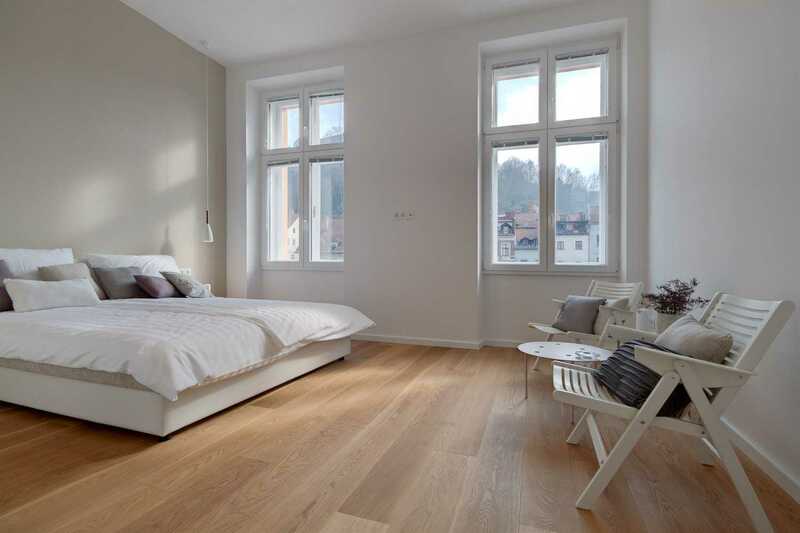 Reserve Your Stay in This Amazing Ljubljana Apartment in the Hearth of the Old Town! 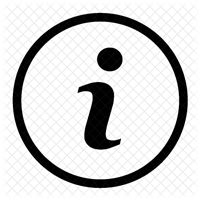 Please note that a minimum stay for booking New Square apartment is three (3) nights. 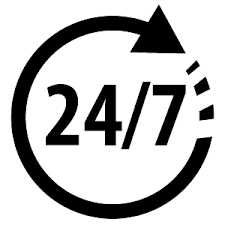 We charge a cleaning fee for a short stay of two nights only. 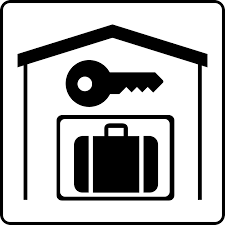 For the New Square apartment we also charge a security deposit in the amount of €100 which is refundable at the check-out if the apartment is left in same condition as rented. As you can probably imagine, this spacious 2-bedroom, 2-bathroom apartment is one of our most popular. 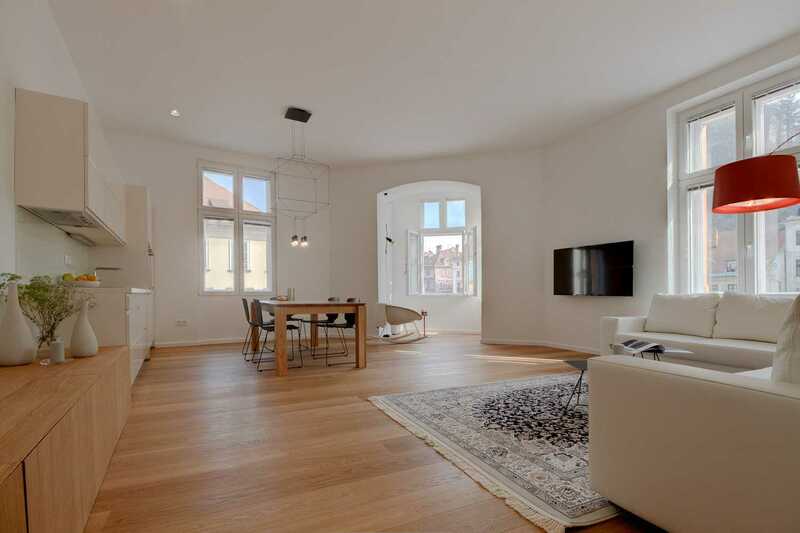 If you’d like to benefit from the unbeatable location of this luxurious Ljubljana holiday apartment please contact us now to check availability. These rates are for 2 persons per night. 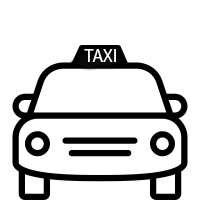 For each additional person please add 30 euros per night. Children under 7 stay free of charge. 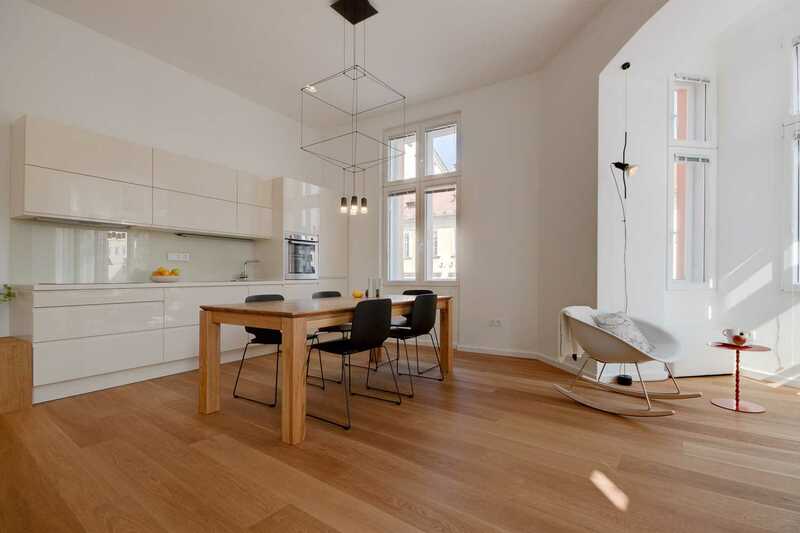 Check out this fine FLA apartment: Ljubljana Apartment Novi Trg – Apartments for Rent in Ljubljana.